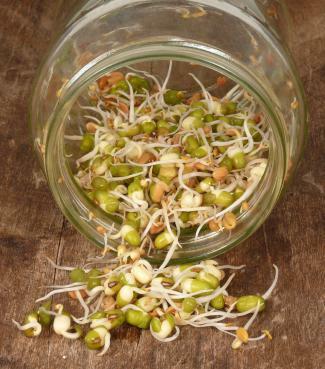 Learning to grow bean sprouts is a healthy, natural way to add vitamins and minerals to your diet. 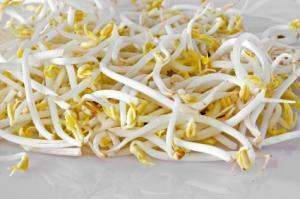 Bean sprouts can be eaten raw or cooked. Bean sprouts are tender, edible shoots produced when a bean germinates. The most widely recognized type is probably mung bean sprouts, which are often found in Asian dishes. Raw, fresh spouts offer a light, crunchy texture to salads and make a nice addition to a healthy sandwich. When used in cooking, it is best to add sprouts during the last few minutes of cooking to help them retain their flavor and crispness. No matter which bean you decide to sprout, the method used to grow bean sprouts is the same. When beans sprout, the final yield is about 2:1. This means if you start out with 1/2 cup beans, you'll get about one cup of sprouts. Rinse your beans thoroughly until the water runs clear. You can start the sprouting process anytime, but you'll want to break it into 12-hour increments. The second step is to soak your beans for 12 hours. This means that if you start the beans at six o'clock in the evening, the next step will follow at six in the morning. If you're not a morning person, you might want to start the soaking process just before bed. Step 3: Place in sprouting container. After the beans have soaked for 12 hours, rinse them and let them drain. For small amounts, place the beans in a glass jar or container. For larger amounts, you can use a bowl. Cover the bowl or jar with cheesecloth, and place it in a dim area that's out of direct sunlight and between 70 and 80 degrees Fahrenheit. Sprouting time depends on temperature and will take three to seven days. Step 4: Sprinkle sprouting beans. Sprinkle the beans with fresh water every 12 hours, but avoid getting them too wet. If you use a jar, roll the jar to help keep all the beans moist. When you're done, turn the jar or bowl upside down in the sink. The cheesecloth works as a strainer to let excess water escape. If you're using a bowl, another option is to use a strainer that fits inside the bowl. You can rinse the sprouting beans with the spray attachment at the sink. Let water drain from the strainer, and place it back in the bowl to catch remaining water. Once your sprouts reach maturity, place them in a bowl or container filled with water. Sprouts will sink to the bottom, and hulls will float to the top, making it easy to skim and discard them. Place sprouts in a strainer, and allow them to drain. Bean sprouts can be eaten immediately or stored in a glass jar or freezer bag several days in the refrigerator. Growing your own sprouts is a delicious way to add variety and nutrition to a vegetarian or vegan diet.